May is looking a bit different around the kitchen. It’s a lot more green. And red. And purple. Don’t forget orange and yellow. I was invited by Whole Foods to take part in a 28-day challenge of consuming a plant-based diet, based on the best-selling book The Engine 2 Diet, written by firefighter Rip Esselstyn, who designed the plan to help his fellow firefighters lose weight and combat health issues such as high cholesterol, diabetes and heart disease. Whole Foods will be introducing this challenge to it’s customers in June, and four local bloggers will be chronicling their 28 days for the Whole Foods clientele to read about as they move forward with their own 28 day plan. Rip’s book outlines all the benefits of a plant-based diet, and includes great testimony from people who have successfully used the plan to lose weight, lower their cholesterol and reverse the devastating effects of diabetes and heart problems. The premise of it goes like this; no processed or packaged foods, no added salts, no animal products, and no fats at all, including all oils. What you eat is a wide variety of vegetables, fruits, whole grains and legumes. The book comes with an extensive recipe collection, all simple and straight forward. There’s no need for any special cooking skills, or equipment or tools or anything. Just cut out the junk, and ramp up the intake of the good stuff. I was intrigued by the idea of it, and enjoyed reading Rip’s book, sent to me free by Whole Foods. He’s got a lot of really bare bones information about the state of our health in the United States, and I don’t need to tell you that it’s really not a pretty picture. And I’m not going to get into any details. We all know how bad it is, even if we make like we don’t notice. My family eats really healthy foods, and I’m pretty diligent about purchasing items that I am comfortable with giving to my guys, but I’m always willing to do more and this challenge is giving me an opportunity to step up our game. As I see it, with what we do already, we’re about halfway there anyway, so taking it to another level won’t be that difficult. I don’t need to lose much weight at all, but we both have a strong desire to be as healthy as we can possibly be, and Mike has had issues with high cholesterol. One of the nice things about Rip’s approach is that it’s really a very open-minded explanation, and it leaves a lot for each individual to interpret on their own. His suggestion, obviously, is to jump right in and start on the challenge, but he readily acknowledges that it’s often a tough step to take, and offers readers several options for easing in to it, and really, the best advice he gives is that it’s really something you can custom tailor to your own needs. And that’s what I did for us. Mike and I easily can give up almost all of our meat consumption, and so that’s where I’m taking our challenge. With the exception of a few social events for me where I’ve eaten meat, our home meals have all been meat free. With the gift card that Whole Foods provided, I stocked up on grains, brown and wild rice, lots of colorful vegetables and fruits and we’ve been enjoying some pretty amazing meals with our bounty. I’m not on board with Rip’s assessment of cutting out fat consumption, as I am firm in my belief and understanding that good fats are a necessity in good body function, for your brain and your autonomic nervous system. We need fat, and although there are many ways to get good fat through plant-based eating, I’ve kept the olive oil, but cut out the butter. I’m already missing my weekly popcorn fix. But it’s a good thing though; we can all stand to do something better for our health. This is giving us motivation, and incentive to push to another level. We love vegetables, thank goodness, and it’s coming to the best time of year for vegetable love in Minnesota, as the Farmers Markets open and the bounty starts pouring in. And I made an agreement with my meat-loving son; I won’t mind if he wants to fix himself a piece of chicken, or a small steak if he’s willing to really try some of the new foods that come out of the kitchen. He didn’t even hesitate before he said ‘Yes’. I don’t really have a ‘recipe’ for this. I made a simple balsamic vinaigrette that I brushed on the vegetables, then I grilled them, chopped them up and mixed them with cooked quinoa, salt and pepper. It was really delicious, and yes, it was surprisingly filling. 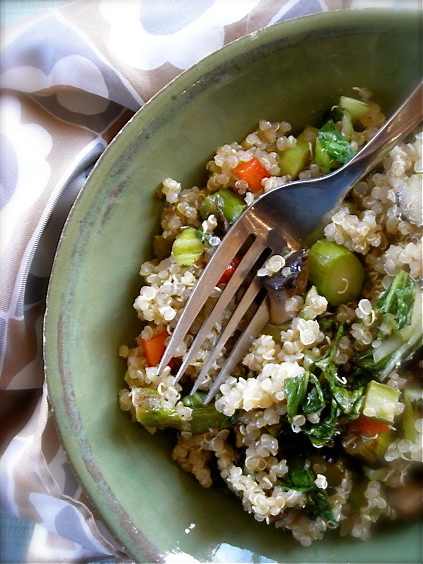 Quinoa cooks in about 15 minutes and it goes with everything. If you haven’t tried this super little grain, I can’t recommend it enough. Stay tuned for more posts about the E2 challenge! Whole Foods provided the book and a gift card free of charge to me for agreeing to participate in the Engine 2 Challenge. All opinions expressed here are mine. Kate, thanks for the quinoa suggestions, I have to try. I love quinoa – I make a vinaigrette of walnut oil, whole grain mustard, honey and sherry vinegar (or red wine vinegar), and mix it with whatever I have at hand (usually nuts, dried fruit and crumbled goat cheese, plus garbanzo beans out of a can). I need more quinoa in my life! 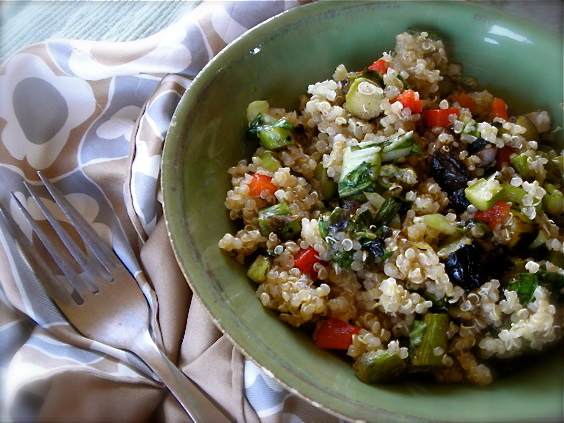 Good suggestion with the grilled vegetables + quinoa. Knowing people with diabetes and heart issues, this plan sounds like something I should check out. And I LOVE quinoa. Your bowl looks delicious.